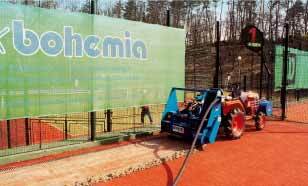 Sport-Technik Bohemia is the sole owner of the machine Beaver on the territory of the Czech and Slovak Republics and, therefore, it has the exclusive right to carry out maintenance of artificial grass using this machine. 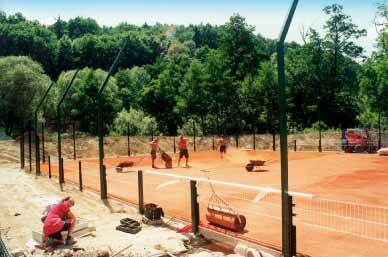 Why is it necessary to renovate artificial grass? Round grains of sand which give the sand-filled lawn its extraordinary sports and playing characteristics are also an outstanding filtering means. All the dirt (dust, particles, organic substances, …) are caught in the upper layer of several millimeters. After some time these materials connect with sand particles and solidify. The degree of sedimentation of dirt is markedly influenced by maintenance. If the surface is brushed and cleaned regularly (at best once daily), the soiled particles cannot be tread into it. However, if maintenance is insufficient, the contaminating substances settle and connect with sand. Constant loading solidifies the upper layer and the solidified layer may become as hard as concrete. The hardened surface of an artificial lawn is soaked in water and the air is blown in it under high pressure - 140 bar. 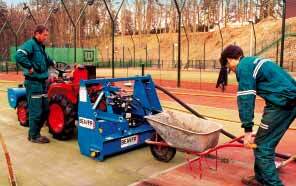 The sides of the court along fencing are cleaned by a special additional machine. The solidified upper layer of sand gets disrupted and removed, gets sucked into a storage tank and subsequently is taken away for more cleaning. After the contaminated sand has been removed, fibres of the artificial lawn return to vertical position, which means that they are perfectly cleaned. The renovated artificial lawn is then again scattered with siliceous sand. The finishing touches are done with brushes for current maintenance.